First of all like I said earlier this months box is stunning!! I love the colours they've used and they've even incorporated it inside the box with the teal/green shredded tissue paper. On the little info card inside they have said, "Our collectors Style Edition celebrates all the new season has to offer. We've taken our cue from the backstage beauty experts who have shaped the A/W 15 trends so consider this your stater kit for the new season". (Sounds great to me). 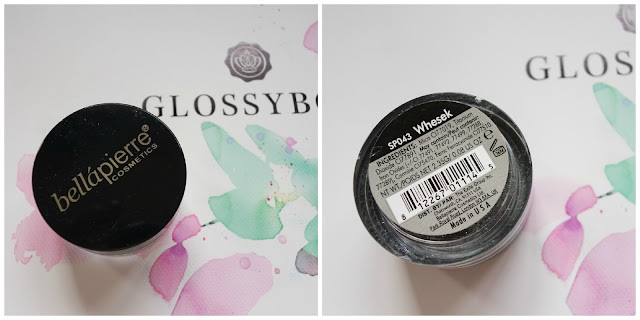 The first product that caught my eye is the brush - now I am brush obsessed (honestly, every time I'm in boots I have to literally drag myself away from the brush section) so I was very excited to see a brush in this months box. It's by a brand called Marsk, I've never heard of them before actually but once I've tried it out a few times and find to love it - I'll be looking for more. It's their eyeshadow brush pro and it's perfectly shaped to help apply eyeshadow easily. I really like the size of this brush and the weight as it's quite light but for the price of £16.70 I think the actual look of the brush could be a bit fancier as it is quite plain but non-the-less I'm still looking forward to giving it a go. Next up is Maria Nila Luminous colour hair masque. Now this is such a decent size and can I say, it smells amazing - so fruity and sweet! This I think is going to be really good for me as I do dye my hair and if you dye your hair too you'll know that it can really weaken it so I can't wait to lather my hair with this as the head of brands has said, "Packed with nourishing, strengthening and protecting ingredients that enhance both coloured and natural hair, Swedish brand Maria Nila's amazing masque will give you the glossiest locks ever!" (now who doesn't want the glossiest locks ever?!?) This is also sulphate and paragon free as well as being 100% vegan! So that's a tick tick tick! 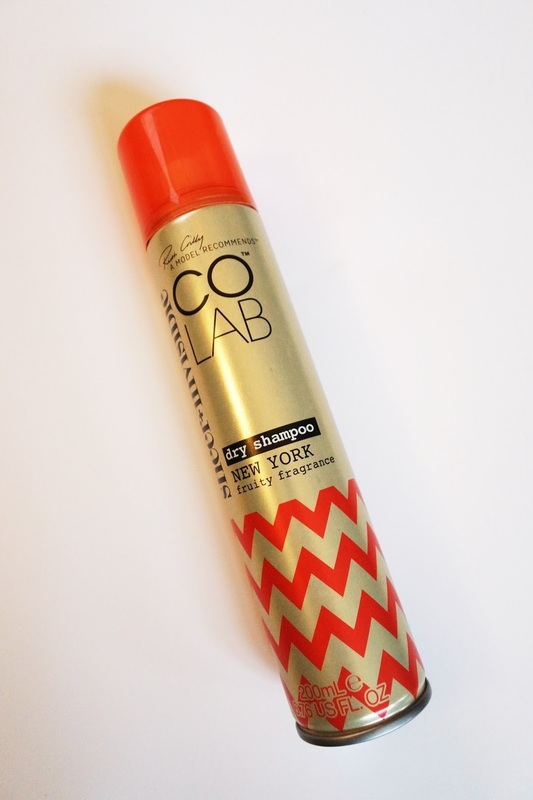 Another great thing about this is that you apply it onto damp hair for only 3 minutes then you rinse it off. I'm really happy with that as I've found with other masques that you have to wait around for 20 minutes or so and sometimes you just don't have the time. So that's another tick from me and the price of the masque is £18.95. Up next is the Nails Inc nail varnish in the shade Uptown which is a blush pink. Now on the info card here are two different colours, the other one being a Khaki green which I would have preferred but I'll still give the pink a go. Nails Inc is a very well known brand so I'm happy to see it in my glossy box - especially because they're £11 a pop! They have said this is a long-lasting nail varnish so I'll be putting that to the test! Now up next is the Bellapierre Shimmer Powder in the shade Whesek (I literally have no idea how to pronounce that) which is a greyish - silver. Disappointingly the lid of this was actually open and the loose eyeshadow had covered all my other products but only a little so I gave them all a little clean. I am an eyeshadow lover but I don't actually have anything like this so that's a plus. Head of operations over at Glossy box has said, "A firm favourite amongst make up artists, Bellapierre's shimmery eyeshadow provides long-lasting colour, without smudging, fading or creasing!" Again I've not used anything by this brand yet but coming in at £12.99 each I'll defiantly be giving it a try! And last but not least is three little grey Invisibobbles - the traceless Hair Ring! I have seen these everywhere but just never seen the fascination as I thought it would be weird to have in your hair - but boy, was I wrong! I actually opened this box at work after picking it up as I knew these were in the box and I had straightened my hair that morning and it was annoying me (does that happen to anyone else, you do your hair all nice at the beginning of the day then half way through it is never out of your face) so I tied it up and it held my hair perfectly. I got home about 4 hours later, took it out, and there was no KINK!! (That never happens with normal hair bands). So I can already say that these little spiralled beauties do exactly what they say and at £4 for 3 I will be picking up some more! So that is September's Glossy Box, do you subscribe? If so what was your favourite product this month? First up is the Pink Flamingo Bubble Bar! I have seen this all over twitter and instagram etc so I just had to buy it! I love the fact that it's on a stick so I can swirl it around in my bath. When I took this out to take my little photos April came running over so she's a fan already - I'll share it with her as she loves bubbles in her bath. So as described ever so well by Lush this smell so much like a fruity cocktail - and the rosewood really does come through to! (I just want to close my eyes and picture my self on a beach, in a bath with a cocktail - on a beach in a bath - strange). Next up is the Skydancer - Far from the Madding Guns Bath Bomb which is a charity bath bomb. All profits go towards satellite tagging hen harrier chicks - which I'm happy doing my little bit! This smells so fresh and amazing with little hints of aniseed. I love the design of this too - the yellow with the blue bird in front is so captivating. I'm so excited to use this and I will be using this first, hopefully when I go back next week I can pick up a couple more as they are a one off product! The next two products are ones that I previously had but didn't get the chance to use (totally over it) so first up is the Creamy Candy Bubble bar! This smells SO DAMN GOOD, honestly good enough to eat. I am definitely a Sweet tooth girl more than a savoury girl so this is right up my street with its candy floss scent! 'Crush under running water to create vanilla candy floss scented bubbles whilst almond oil and cocoa butter moisture the skin. 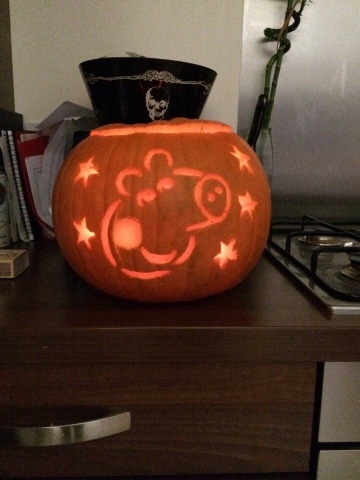 Smells good enough to eat (please don't though, that would be silly). Self preserving and Suitable for vegans'. This is also so pleasing to the eye (the majority of Lush's products are) and the little candy-like flower pressed into the centre is so pretty. Can't wait to use this - I think April will also be a major fan of this. Last but certainly not least is the Dragon Egg bath ballistic which I had previously bought too. When I have a sniff of the little bag its in I honestly smell lemon sherbet! (You know, the little multi-coloured tubes of sherbet you used to get as a kid - like that). I am very intrigued swell by the circle of colours so I'm excited to see when it's launched into the bath as i think it's going to explode and they're going to escape everywhere! This sounds exactly what I am in need for, Ive have a very hard time at work lately and I feel so wrapped up with stress so this I'm looking forward to watching this fizz away as well as my stress. So that is all from my little Lush Haul, like I said I am going back either this coming week or the following so there may be another haul. But for now I'm going to enjoy treating myself to these beauties. Have you been into your local Lush Store recently, what are your favourites? I'm so excited to be writing this post (I'm pretty sure I write this every other time now but it's true) as it is now coming to my favourite time of the year, Autumn!! 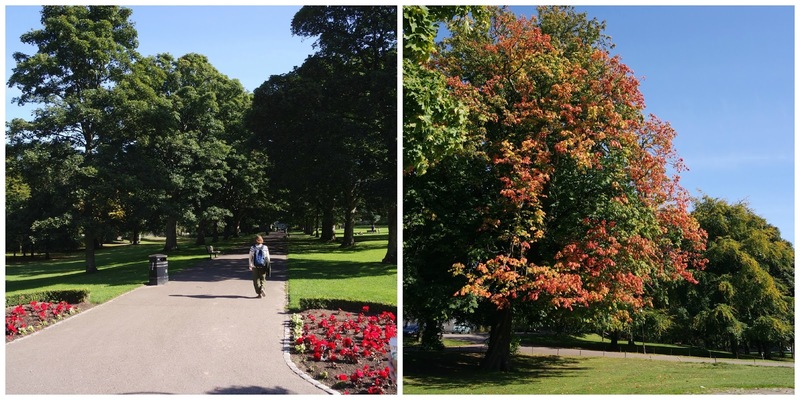 Holy Hell this year has flown by but the time has come that there a crispness in the air and the leaves are turning a beautiful shade of orange - I'm so happy!! Now Sam and I were actually April free this past weekend - she was away having a lovely time with her Grandma and Auntie at a caravan in Cruden Bay - she was very excited (I'm saying excited a lot - it's because I'm writing about Autumn - babbling now) so we thought we'd have a little inexpensive day out (payday - so close yet so far away) so we decided to go to Westburn Park, which is a lovely big park near the centre of Aberdeen full of big old trees and a little river, and have a little conker hunt! We did this last year with April and she had a blast but this year we thought we would go and then take her another day. 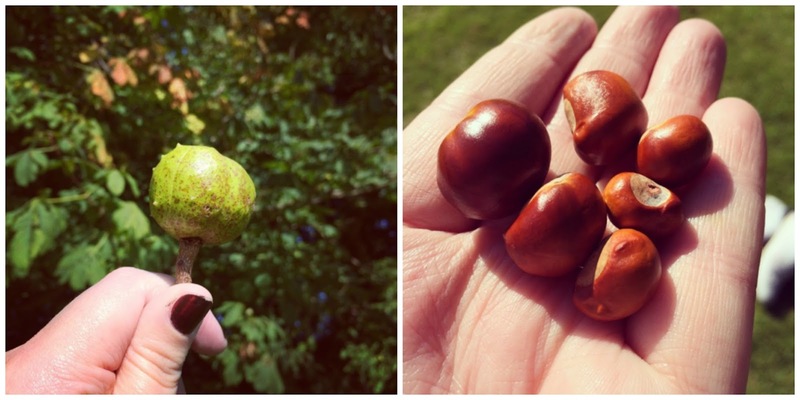 Long introduction to this post but here we go, so here is my very long post about all things autumn and our little Conker Adventure! 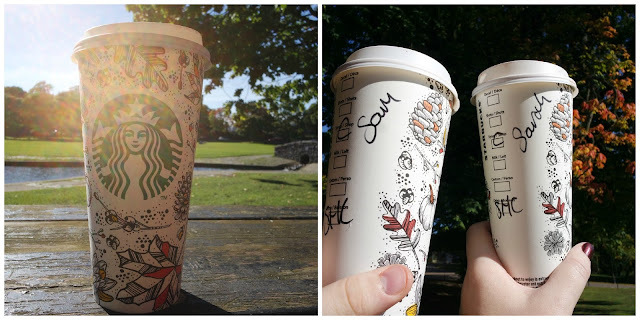 (disclaimer: there's going to be a whole lotta' orange and burgundy colours, leaves, the ever so damn beautiful Starbucks cup and well, you get my drift). So before heading to the park we did make a little detour to Starbucks! Simply to get my hands on one of these cups! 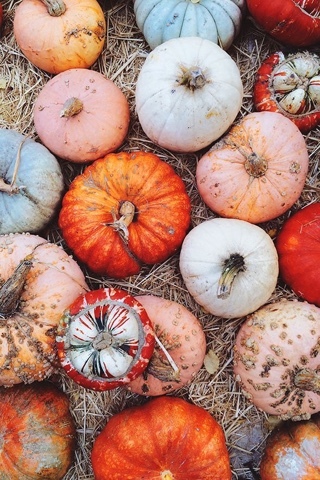 (Aren't they the most instagrammable thing ever?) We both decided to have a Venti Caramel signature hot chocolate - It was amazing!! The first hot chocolate of the year always is - it was just missing marshmallows. (By the way how cute a we with our matching cups - we were also were matching converse - we're cool like that). So we honestly wrapped up for a chilly day but in fact it was almost like the middle of summer - there was a clear blue sky, birds singing and wasps flying about - a lot wasps! Walking through the park everyone was wearing just shirts and shorts but sam and I were in jackets and hoodies, we were melting. It was so nice just having a relaxing walk together with no stresses. We had also made a little stop at a shop to grab some tasties so we could have a little picnic, sandwiches, cheese strings and sweets! I also picked up a bag of Coconut and Caramel Poshcorn - which is fancy popcorn apparently. My thinking was I love coconut flavoured things and I love caramel so I thought it would be a hit - I was wrong, so wrong. It tasted horrible, like perfume flavour pieces of stale popcorn. (I was sooo disappointed - plus I paid £2+ for it). Yuck! But our main reason for going to these parks was to find some Conkers! We went here last year around the same time and found about 50 plus but this year we were either too early or too late but we did find a handful! I don't know why we have this tradition but I love it - it's just nice to have such a green area in the centre of the city. I never went on conker hunts when I was little so I'm making up for it now. We gave April some of the conkers this morning and she's been holding onto them like they're her most cherished possession, the remainder i am going to be putting them in the corners of the rooms in our house. Apparently doing this will keep spiders out - not sure if this is true but I'm going to give it a bash as I'm terrified of the eight-legged beasties! I'm really looking forward to all the leaves changing and the nights getting darker. 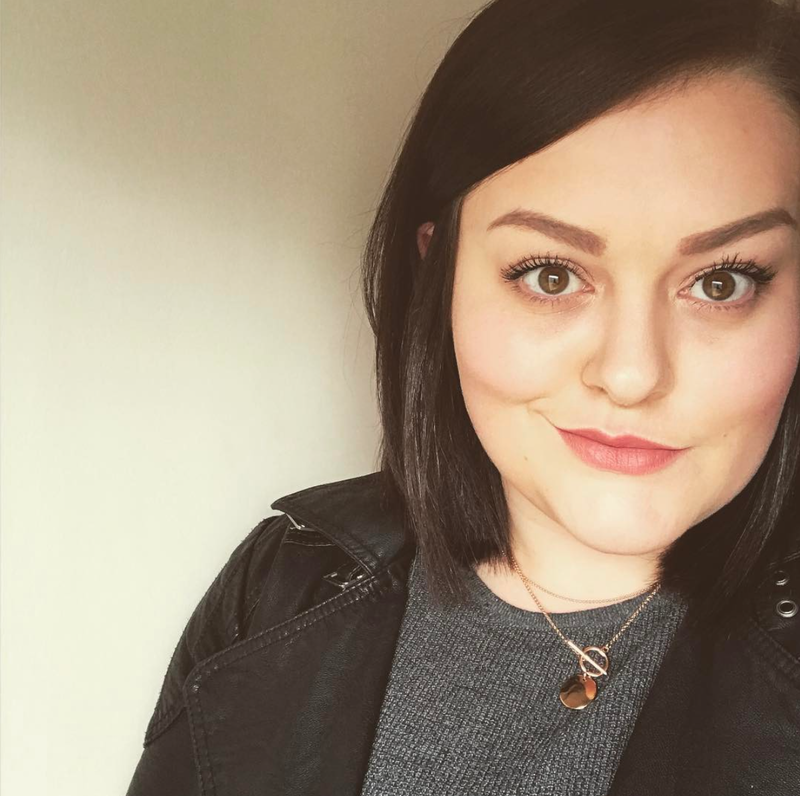 I'm also looking forward to doing more blog posts like this one - it's a nice change from the beauty side of it (but don't worry, there's still plenty more beauty coming - Hi my name is Sarah and I'm a Beauty Junkie). So that was our little Autumnal Adventure. 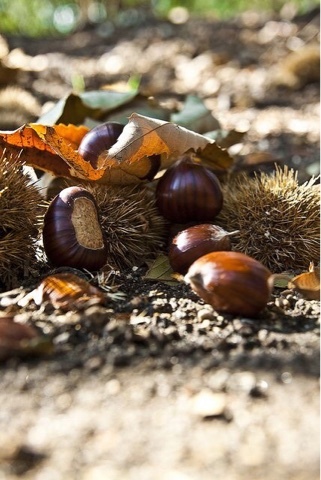 Do you have any traditions for this time of year and have you been able to find some conkers? 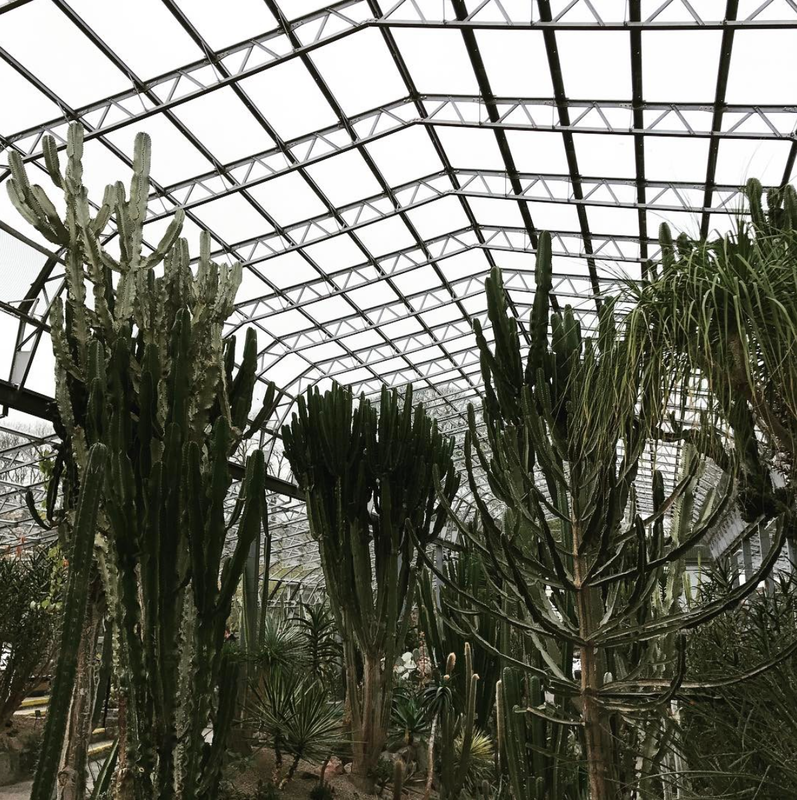 Today's post is going to be a list of all the goals I want to achieve by the time winter sneaks up! Autumn is literally my favourite time of year (but isn't it so weird how people love this time of year and that it's so beautiful yet everything is dying - yeah) and every year I set myself a little list of things I want to do and I hardly ever do any of them - so this year I thought if I did a whole post about them then it might actually give me a good old kick up the arse to do them. So if you're a fan of Autumn and would like to make the most of it then check out my To Do List! Try a Pumpkin spiced latte - not a fan of Coffee but I've heard so many good things so I'm willing to try it. Crunch in leaves - OMG that's my favourite part! 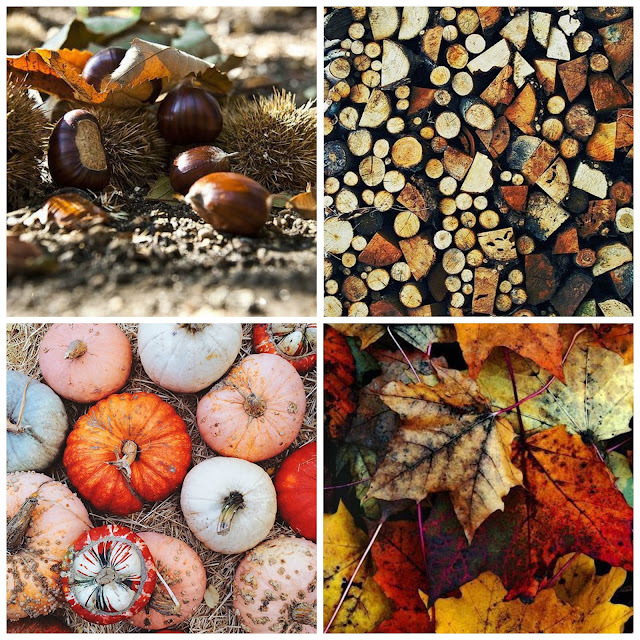 Go on a Conker Hunt. Watch Hocus Pocus - OK I do manage this every year - it's a classic! 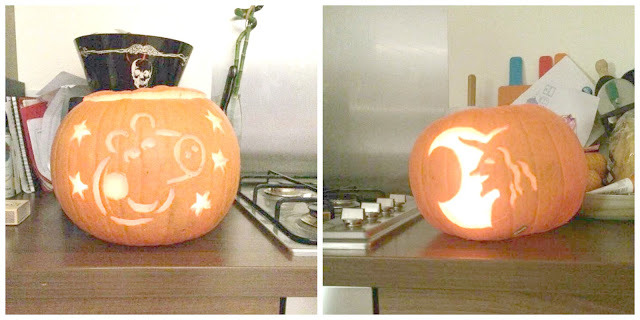 Carve a Pumpkin - I'll leave my 2 from last year down below. Take a foggy morning walk through the trees. Make toffee apples - horrible for your teeth - perfect for your tummy! 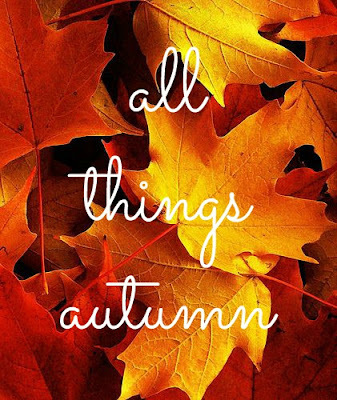 So that is my little To Do List, Do you have an Autumn Tradition or something you've always wanted to do? This post is just going to be short and sweet. I first set out doing this saying that I would do three posts a week, which to begin with was fine. But recently it's been a bit of a struggle, work has been very stressful (thank god it's almost the weekend), home life has been, well home life and I don't want to be taking time away from family because I have a blog post to write (family is the most important thing to me) so I'm going to go down to two a week! I think if I kept doing three just now then I wouldn't enjoy it and I'd start to resent it - which I never want that to happen. So for now, not saying that it won't go back up in the future, but for now two is more realistic with my life. So every Tuesday and Saturday I will be posting. 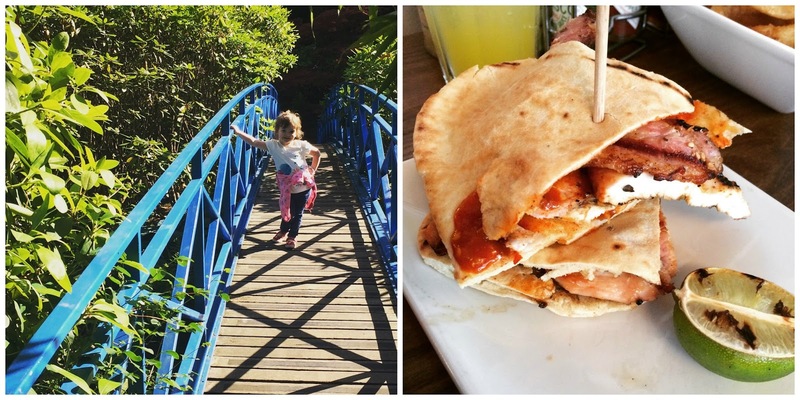 I couldn't do a post without a picture though, so if you don't follow me on instagram (the link to my instagram is at the header) here are a couple of my favourite photo's that I've taken recently. 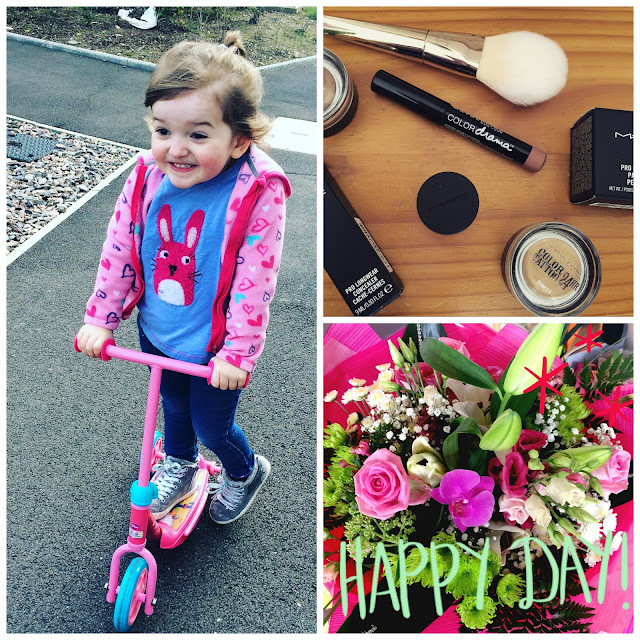 The first day April could 'scoot' on her scooter, A mini make up Haul and the beautiful bouquet of flowers Sam sent me on my birthday. April (looking so damn grown up) and my favourite from Handmade Burger, Piri Piri chicken with bacon in a pitta bread (Now I'm starving). My Review of August's Glossy Box! Earlier on last month I did a blog post on my very first Glossy Box - if you haven't read that, then go read that then come back. You back? Good! So I have been using these products over the past month now so I thought I would do a review. Some of the products I have loved and others I haven't been to fussed about. I am going to start with the products that I have been impressed by which was all bar 2 really. 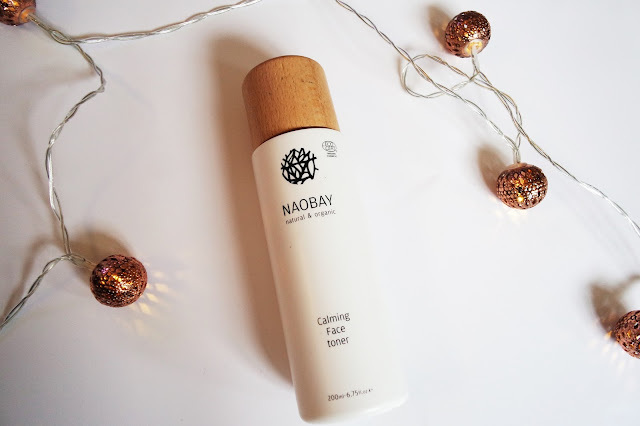 First up is the Naobay Calming Face Toner. Now I have never used a toner before until this as I've explained before that I never really had a skincare routine until recently, but this was a lovely addition. I just feel that after I use my cleanser this is perfect to sweep across my face and remove any traces of make up left. I also love the packaging of this - the wooden lid looks lovely on my vanity. The only thing I was a little disappointed with was that on the Glossy Box product fact card was that it said that it had a nice citrus smell and I just don't think it has any smell at all. But other than that I have loved using this and I definitely want to keep it part of my skincare routine! Next up is the Manna Kadar conditioning eyelash primer. Now, to be perfectly honest with you when I saw this in my box I was very apprehensive (I've only just been converted to an eyelid primer - I thought an eyelash primer was just taking the biscuit). But I was pleasantly surprised, I find that this really helps my mascara cling to my lashes even more! But I don't think it would be a product that I would buy over and over again, it's more of a luxury product! But I do enjoy having it as a part of my collection. Next up is a product I've spoken a lot about on both here and over on my twitter, it's the Sass Intimate Purifying Cleanser. Now, I was using this as a facial cleaner as it I was instructed to by my little glossy box info card - but after about a week of using this on my face (which by the way, left my face feeling amazing) I found out that it was actually a cleanser for my lady thang (I'm channelling my inner Miley Cyrus - up in here!) We're all grown ups here and this is my blog so if I can't speak about that, then I may as well shut this down here. But this is honestly now something that I've been using ever other day and I don't think twice about it. I just see it as part of my typical shower routine. I love this and the brand themselves have been really good over chatting away with me and recommending more products over twitter - on pay day I will be checking out the rest of their range in boots! I'm very glad this was in my Glossy Box! 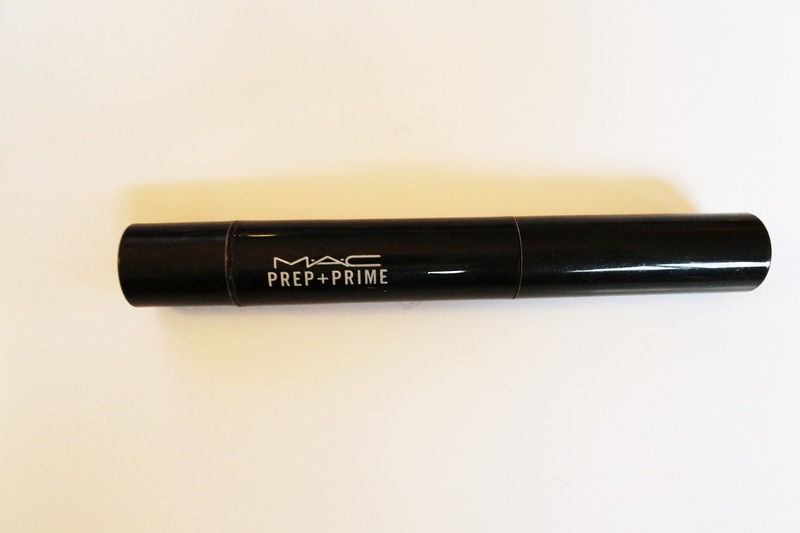 Next up is my most disappointing product - but this is only because of the shade. 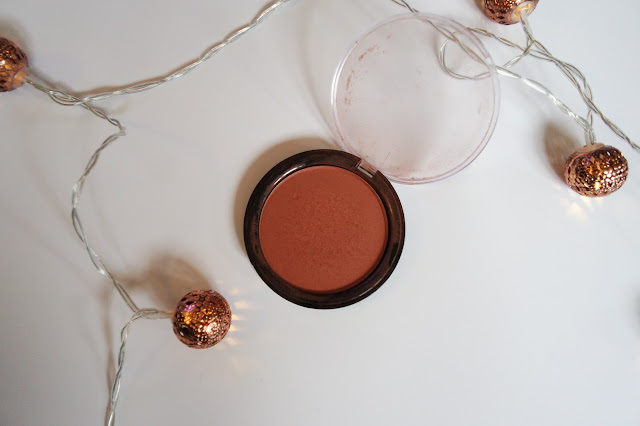 It's the Emite Artist Colour Powder Blush, which the guys at glossy box deemed this as a 'Blunzer' so a mix between a blush and a bronzer. I am very very pale (Imagine a milk bottle - yup, that's me) so as soon as I saw this I just knew it would be too dark for me. But putting that aside I did try it and I do really like it, the pigmentation is brilliant as it the formula. I just used a little at a time and I found it to be quite bendable. So if it were in a lighter shade I'd definitely be reaching for it more, but sadly i think this will either collect dust or be given to a friend. Last but not least is the MeMeMe Lip Glide in the shade Playful Peach. I have been trying this out now and then but it just isn't my kind of lip colour. It is a beautiful coral-pink-peach which I'm sure would suit a lot of people but I just don't think it suits me. The texture though is great! It's very soft and easy to apply. I think this will be added into the little selection of make up that I let April play around with - which I'm sure will make her very happy! So that is all from August's Glossy Box. 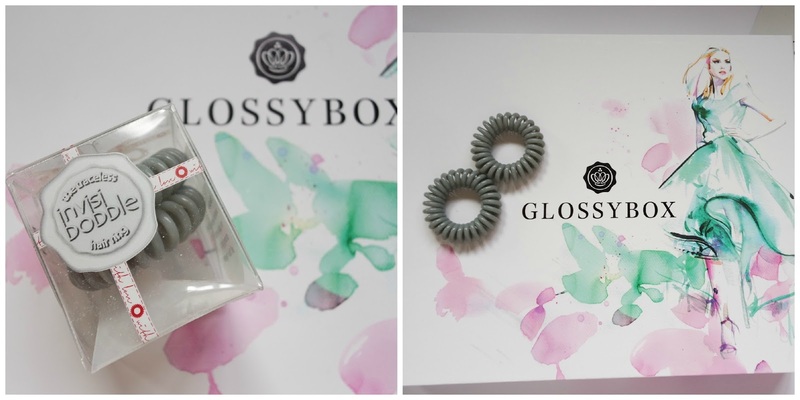 Do you get the Glossy Box? What did you think of your August Products? I can't wait to see what's in this month's box! I am so excited to be writing this post as I got the honour of managing to get my hands on this months Blogger Beauty Box! Now if you don't know what this is, it's a monthly beauty box for bloggers co - set up by Vix Meldrew (I will leave all the links down below - you should definitely check it out) it is only £10 (an absolute bargain) and there is only a very small amount available each month so when I got a email saying that I had managed to get one I was super excited! The packaging was simplistic but classic! I really like the pop of pink with the tissue paper and when I opened it up I literally yelped with excitement (when I say literally, I mean literally). 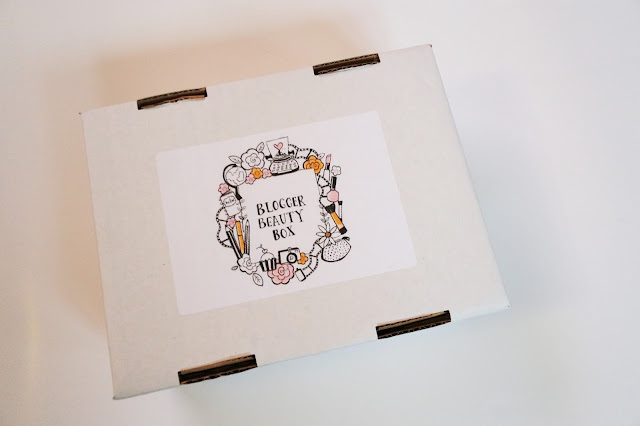 I just want to start off by saying that I think this is such great value for money (like I said earlier it's £10 including postage and packaging) and I can't begin to imagine what it must take to get all this arranged with brands etc - so thank you very much to all involved at Blogger Beauty Box - I appreciate all the hard work! So I'll stop babbling and get to the products!! There are 5 beauty products that I received in this months box (There was also a cheeky strawberry maoam sweet, but I ate that before I reached for my camera). So first up was some Yes to - Age refresh cleansing facial wipes.I have never seen anything from this brand but it definitely makes a change from the average baby wipes I carry around with me (all you mums out there will know exactly what I'm talking about) I opened these up straight away to have a smell and they smell so amazingly fruity - I'm looking forward to carrying these on the go! There's so many times when I'm out and about and need a little re-fresh - so I think these are going to be perfect. I was then attracted to the two lip products. I got a beautiful movements cosmetics lip gloss in the shade gypsy spirit and also a Makeup Revolution (one of my all time favourite affordable brands) lipstick in the shade luscious. 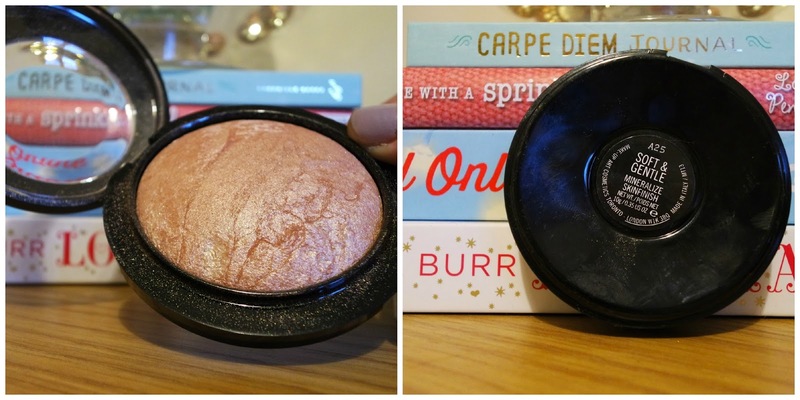 I love the colour of Gypsy Spirit - it's a nice warm terracotta colour and I absolutely love the fact that it is cruelty free as well as paraben free! 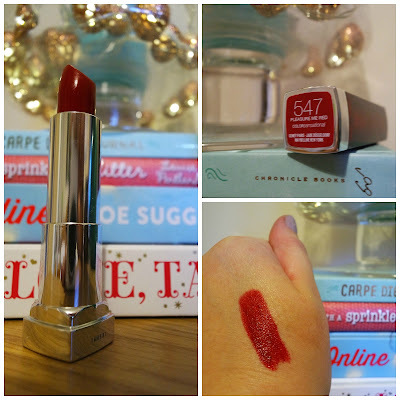 The Make Up revolution lipstick is very similar in colour to Gypsy Spirit and they will either be great alone but they will also work perfectly together! I have been pushing myself with wearing colour on my lips so I think these will both be really good for transitioning into Autumn (by the way - how excited are we that it's almost autumn - yay!). The next thing that I picked up was a sample of Yours Truly Organics beautiful inside and out Fix me! Repairing serum. This is something I have never used before so I'm quite looking forward to trying it out. It says that it repairs smoothen and brightens your skin (tick!) Who doesn't want a radiant complexion - fingers crossed that it agrees with me! And last but certainly not least, as this product could be my favourite of them all, is the Sniffy Wiffy Raspberry Hand Cream. Now I have a skin condition on my hands called Pompholyx - which is a mix between dermatitis and eczema (my hands get all blotchy and sore - not nice). It tends to get really bad at this time of year so I will literally try any hand cream hoping that it keeps it at bay! So I'm really looking forward to using this - I also like that it's the first company to bring the fight against breast and testicular cancer into bathrooms everywhere. It's such a great way of bringing awareness - I'm sure no matter who you are or where you are in the world you or your family have been affected in some way by cancer. I'm going to leave their link down below so you can find out more about them and their mission - also it smells good enough to eat and it has already left my hands feeling super soft and that's only after using it twice!! So that is my Blogger Beauty Box for the month of September. Here is where you can find their blog and register for a box (be quick as when they're gone - they're gone - and as I said before it is only available to bloggers - but you can enter to win a box! 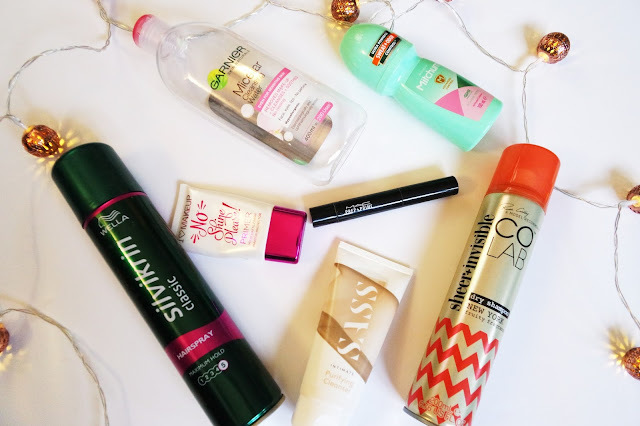 Have you ever used any of these products, I'd love to know how you got on with them? Flash back to about 5 months ago and my Make Up Collection only really consisted of one mascara, a little eyeshadow palette, a concealer and some baby wipes. But now, I personally (Sam does too - he thinks there's too much) think that I have a fair collection. I now have a skincare routine - which I have never had one before - baby wipes no more! I now have multiple lip products, mascaras, foundations etc etc. So today's post is going to be about all the empties I've been storing up, I have finished these products over the past month and some have been great and others not so much. So I'm going to do a mini review on them, so if that sounds up your alley then carry on reading. 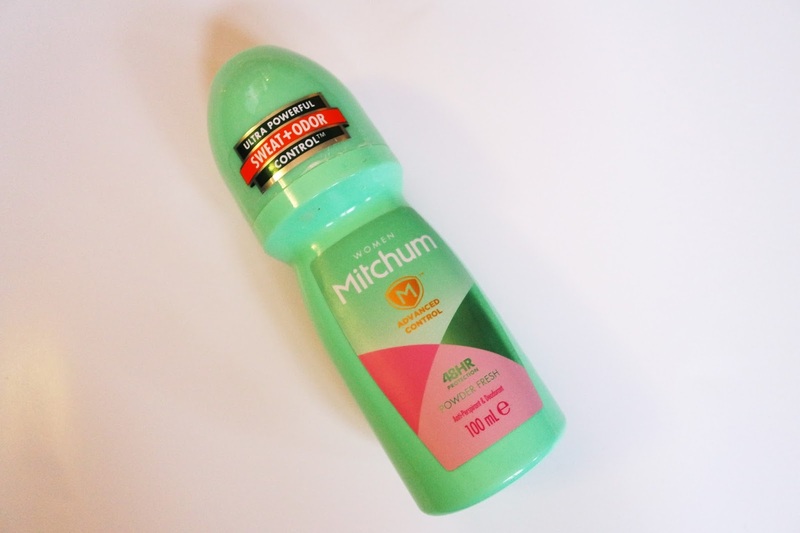 First up is a product that I have used every single day - it's the Mitchum Advanced Control, 48hr Protection Powder Fresh Deodorant. I actually bought this as my mum recommended it to me. She is a very busy woman who is constantly on her feet and she said that this literally makes you sweat free. I was sold, there's nothing worse than smelling a little of BO, and this is honestly one of the best roll on deodorants I've ever used. I apply it first thing in the morning and I'm protected all day long! I will be buying this again. 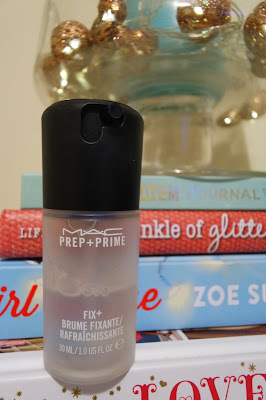 Next up, I'm very sad to say this is finished, its my MAC Prep and Prime in Radiant Rose. This was one of my very first MAC products. I bought this because I have baggage. Big dark baggage under my eyes, I had heard that this really helps to brighten that area and it does exactly that. I have loved using this and the applicator is amazing, just like a little brush that I drew a couple of lines under each of my eyes and dabbed it in with my Real Techniques Complexion Sponge and voila - "bags-be-gone". Again, I will be buying this, and probably over and over again! This product I wasn't so happy with. 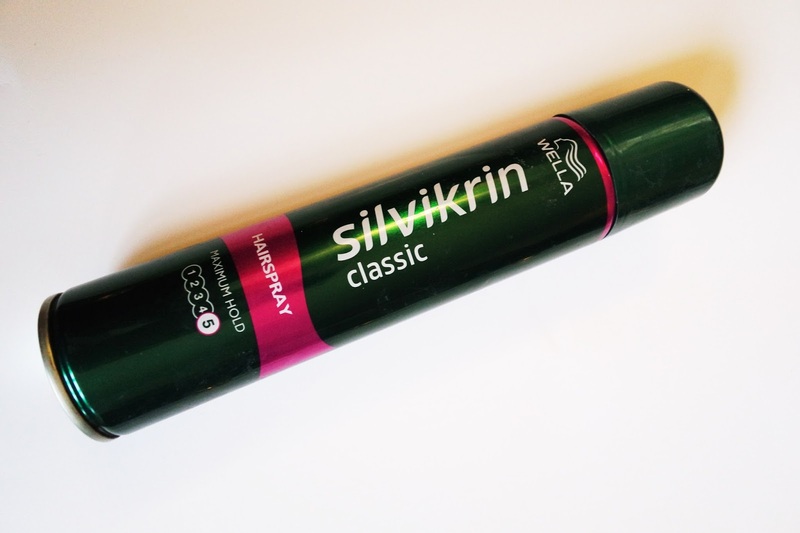 It's the Silvikrin classic hairspray by Wella. The reason I wasn't a massive fan of this was because even with a light spray my hair went crispy (and I only like crispy batter, crisps and rice crispy treats - not crispy hair). I just think because it went crispy it made my hair look really greasy - now give it it's due - the hold is 5 - maximum hold so my hair didn't budge - but it didn't sit nice. So no, I won't be buying this again in this hold, but possibly in a different one. Next is a product that I want to say I use every day, but what's the point in lying to you and myself! 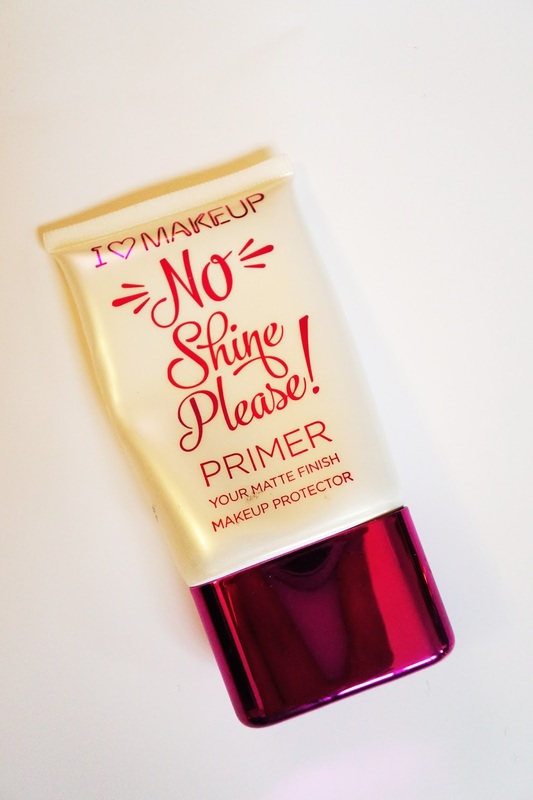 It's the I heart Make Up - no shine please primer, matte. (phew I even got tired typing that). I know you should always prime as it smoothes the surface of your face and helps your make up last longer, but most days I'm applying my make up at the back of 6 in the morning and I just can't be bothered. But every single time I have used this I have never been disappointed! I love this so much that I have 2 more full tubes! 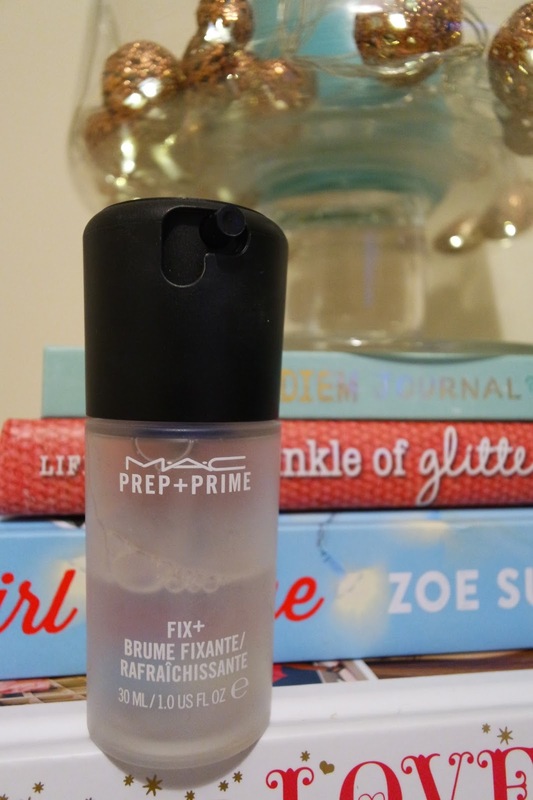 It's the first primer i have ever used and it does exactly what it's meant to do! I will and have been buying more! (plus can I also add it's under £2 - just saying'). Another hair product that I have used up it the COLAB Sheer + Invisible dry shampoo in the New York Fruity Fragrance. I am very indifferent about this. It's great for when you've got 3 day hair and it's just needing a little refresh but I have been reading very bad things about dry shampoo, that it can lead to hair loss! I don't like the sound of that (I'm sure you don't either) but as it's not something that I use on a daily basis I don't think it's going to cause me major damage! The smell of this is amazing!! Now when i saw 'New York Fragrance' I was thinking (by the way, before I start, I have never been to New York so this is just what I would think, also I don't want to offend anyone because I'm sure you're all lovely smelling people and I'm sure new york is too) it would smell like subways, pretzels and a little bit of car exhausts - but in actual fact I think this smells lovely! It's what I imagine central park on a fresh spring morning with all the flowers coming into bloom. It's super fruity and it actually leaves my hair smelling like that all day! Thumbs up from me ad I'm definitely going to be buying more of this and different fragrances from their range. Now this is a product that I received in August's Glossy Box - SASS Intimate cleanser. Now, funny story short, Glossy Box actually mistakenly put on their fact card that this was a cleanser for your face. So for about a week I was using this on my face, my face has never been smoother. So one night I found the brand on twitter, followed them and scrolled through some of their tweets - and found out that it was actually a cleanser for your intimate area!! (Very embarrassing) But anyway, I started using it for it's actual purpose and I love it! One of the things it claims is that it'll help keep you shower fresh all day - that it does! I am very intrigued to have a try of more products from their range!! Last but definitely not least is a product that I have been using every single day, it's the Garnier Micellar Cleansing water. I have not used a single baby wipe/make up wipe since buying this!! 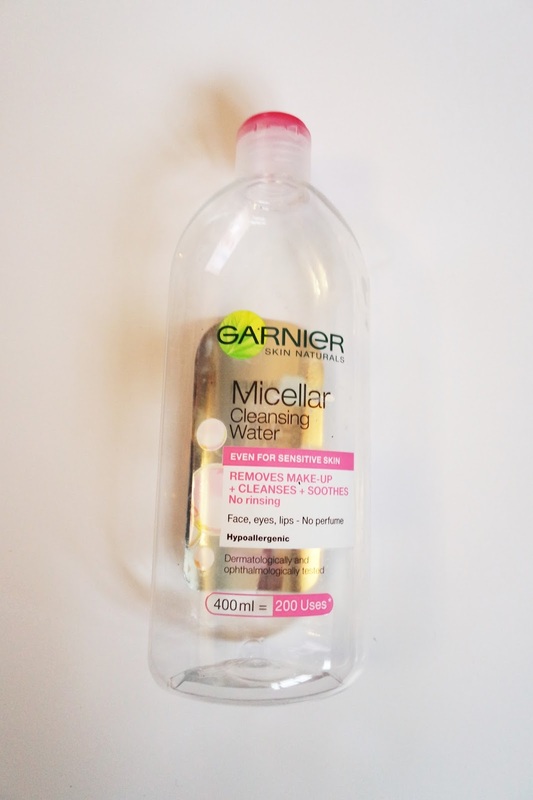 I had heard so many different peoples opinions on Micellar waters and I thought I should just try it and see for myself. Well, this takes my make up off so effortlessly (like no scrubbing happens at all - just a gentle wipe and it removes even mascara - yes mascara). One of the reasons why I was hesitant at first is because my skin is super sensitive so I did make sure that I bought one suitable for sensitive skin and it has not irritated my skin at all!! It's a fair size bottle, 400ml which they have said will last for 200 uses. I'm not sure I got 200 uses out of it but I think I'm using way too much but I haven't been far off! I will be buying this again, I actually already have! So that is my product empties from the past month or two, most I loved some didn't really tickle my pickle. What products have you went through and did you love them or were you not too crazy for them?? My name is Sam and I have control over this weeks “Guest Blog Post” here on B.V.E. 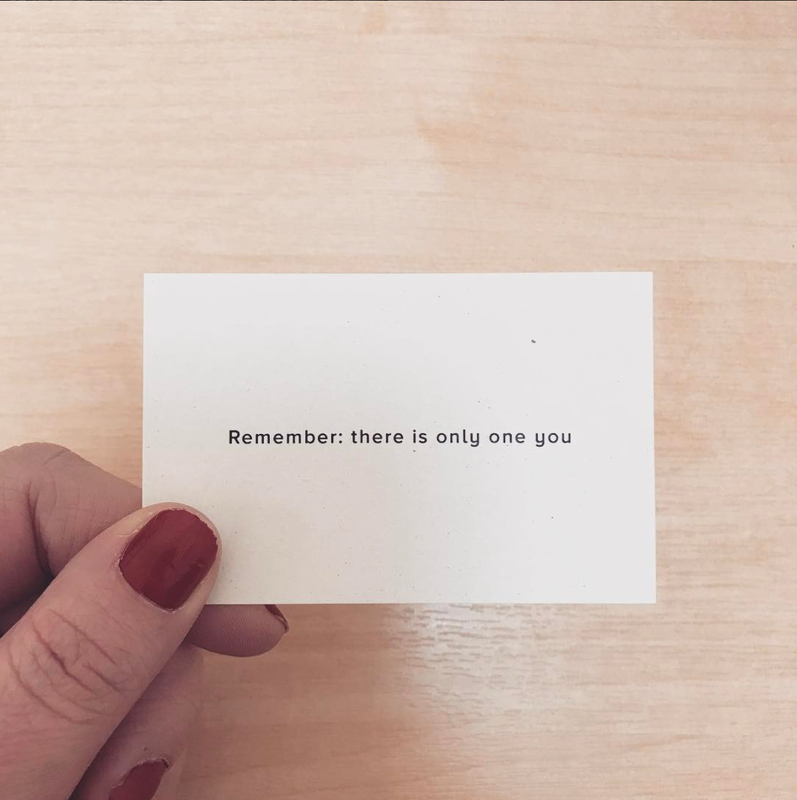 As you’ve probably guessed, my wonderful fiancée Sarah runs this blog and having popped up quite a few times in her previous posts, I felt it would be a good chance to let her take a break and hand the reigns over to me. So were going to kick this off with the guy who introduced us to the “Thrift Shop”, you know the one that’s “Downtown”? (See what I did there?!) This is one of those songs that had me hooked the first time I heard it. There’s just so much going on in the song that it’s hard not to like. I’m not a massive fan of Macklemore but I’ll listen if one of his songs are on. He should feel privileged to be on this list! I like Disclosure. I like Sam Smith. These two artists are definitely a perfect match (similar to the pairing of Clean Bandit and Jess Glynne) They previously worked together on Disclosure’s first big hit “Latch” back in 2013 and it’s still song I find myself going back to. There’s something about this song that makes it catchy, I’m pretty sure its the “wompy” bassline. I remember hearing an instrumental version of this song in the Apple Music announcement video and hunted high and low trying to find out what it was (I don’t use Shazam!) and had almost given up hope when I heard it on the radio. This guy has an incredible voice, and an even more incredible hair do! I was also a fan of “Earned It”, which featured in the movie adaption of that dirty book that raunchy old woman wrote. Anybody who says they don’t like the song is lying to us. And themselves. Anybody who watched “The Whisper Challenge” will know that I am a massive fan of Calvin Harris and should have expected him to pop up at some point in this post. His newest hit is probably my favourite he’s released to date and anybody who was looking for that “summer jam” should be happy he’s provided them with one! If this is a taste of things to come, I’m looking forward to his next album for sure. It’s here, number 1 on my list! SPREAD IT LIKE PEANUT BUTTER JELLY!! The first time I heard this song, I thought it was utter garbage. And then I heard it again. And again. I could safely say that this is one of my most listened to songs on Apple Music, and their album is also a sure fire winner with dance music fans out there. Be sure to check it out! Alas, we have reached the end of our time together. Lets not be sad about it. I’m glad we’re leaving here with a better understanding of each other and I’m no longer just a name in a blog! Be sure to check back for the next post on B.V.E and who knows, Sarah might even let me back and we can mingle some more. 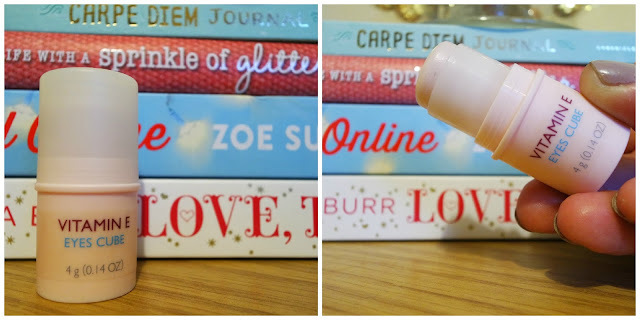 It's that time of month again (no, not that time of month), Monthly Favourites! I can't believe August is over and done with, for me it has been an exceptionally testing month so I'm glad to see it go! But I did definitely buy a few (only a few, I promise, ok maybe more than a few) new beauty items to add to my collection and quite a few have made the cut for my Favourites! So I'm just going to dive on in, come with me if you want to see my little idea of Heaven!! First up is something that is actually helping me with typing this blog post! It's my new glasses from Specsavers! I haven't worn glasses in a good few years, I actually lost both of my old pairs and never replaced them but recently I have been experiencing visual migraines so my doctor recommended that I go and get my old eyeballs tested and low and behold - I still need glasses! I got two pairs but these are my favourite - A huge bold black frame which suits my face and a lovely tortoise shell pattern on the dainty legs - I love them!! Next up is two little products from the Body Shop. 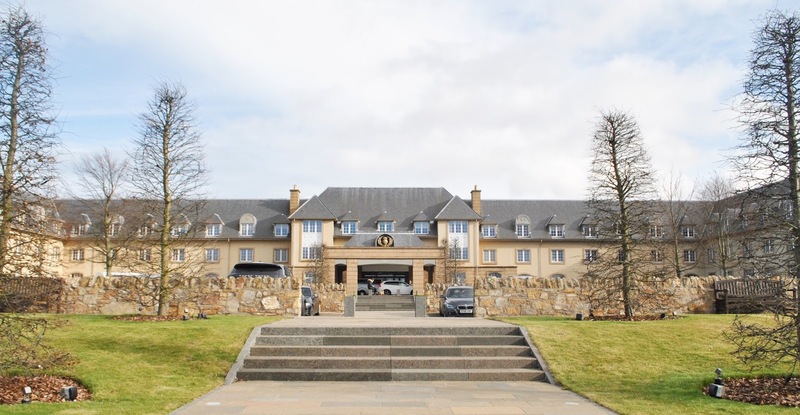 Over the years I have forgotten all about it really, so when Eilidh and I were walking past a while ago I had to go in! My intentions were just to have a look and walk out but no, my purse jumped out of my bag and before I knew it I had bought a couple of things! 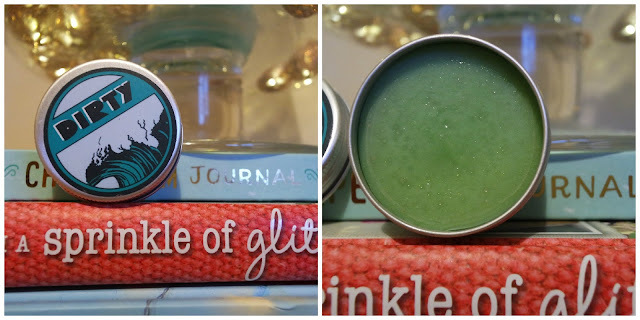 (so happy) I picked up the Vitamin E Eyes Cube which i had actually seen advertised by the Body Shop on YouTube - I was very intrigued so I had to try it out (for the blog, obviously). It's essentially a refreshing balm for your eyes!! I apply this 2 times a day, in the morning after toning and moisturising and then again last thing after taking off my make up and cleansing. It makes your under eyes feel amazing!! It actually wakes me up in the morning and my under eyes have never felt softer! I highly recommend this!! 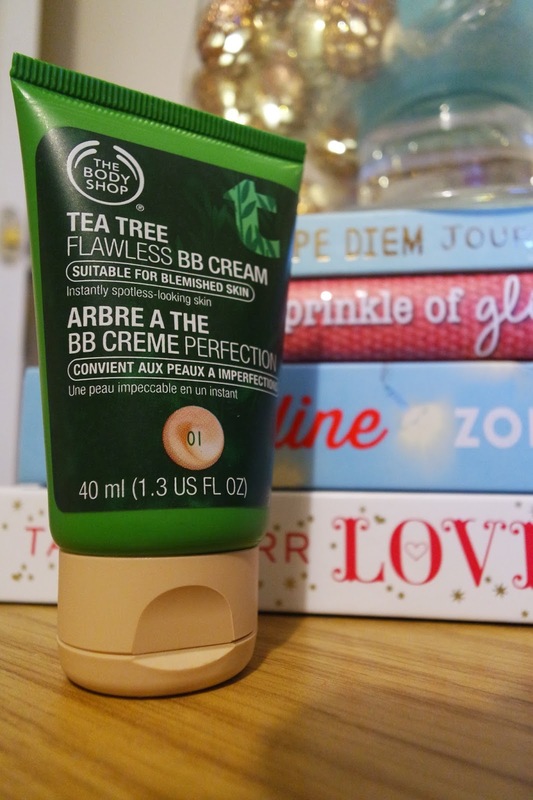 My other favourite goodie that I bought is the Tea Tree Flawless BB Cream in the shade 01 - I have been wearing this to work for the past two weeks now and my skin loves it, my nose on the other hand doesn't appreciate the strong smell, but don't be put off, it goes away after applying, it doesn't stick around all day (it's just quite an overwhelming tea tree scent). I just really like the coverage of this - I would say its light to medium and it honestly feels like I'm not wearing a base which I really prefer when I'm at work all day. This has honestly budged my MAC mineralise foundation and my Rimmel Wake Me Up foundation to the back of my collection! I also want to add that it's super affordable at under £10. I am definitely popping into the Body Shop more often! I am so (literally sooooo) excited to finally own these two products! MAC mineralise Skin Finish in Soft & Gentle and MAC Fix +. Now Jaclyn Hill is to blame for my obsession with Fix + as every time I see her use it in a video I crave the effect she gets. I have such dry skin and I find when I use powder is sometimes goes cake - so a couple of sprays of this makes that go away - plus it makes me look DEWY!! OMFG I have always wanted to achieve that dewy look and I finally can! (heel-click) I did only buy a little travel size just to try it just in case I found it made me look too wet but it doesn't so I will be buying a full size one, also I want to try their new Rose Fragrance one!! Now can we just take a minute to admire this - MAC's mineralise skinfinish in the shade Soft and Gentle - ahhhhh! I love this!! It is my perfect holy grail (only had it a couple of weeks and can safely say that) highlight!! Its beautiful for along the tops of my cheekbones, cupids bow and all this other little bit you want a nice natural glow - also it's the perfect shade for me and my pale skin! This is super super pigmented and I only need to use a little (a little really does go a long way) to achieve this. I was literally so excited buying this and it will be with me forever!! My next favourite is this little pot of niceness! It's a solid perfume from lush - now I do have to thank my Mum and my Sister for introducing me to this. It's a very strange concept as it's like a lip balm form but I literally (realised that I say literally a lot, like literally) love this! Now I chose the fragrance Dirty, which is contradicts itself as it so minty and fresh, with light smells of the ocean and sun tan lotion!! I put this one first thing in the morning, which for me is the back of six and it is still there at 9 o'clock at night! I don't really have anything else to say about it, I love it and I'm not much of a perfume person, but this is by far my favourite! Now this is a very brave favourite of mine and it's not one I had expected to feature on my blog at all but I have pushed myself out of my comfort zone and look at this little beauty! 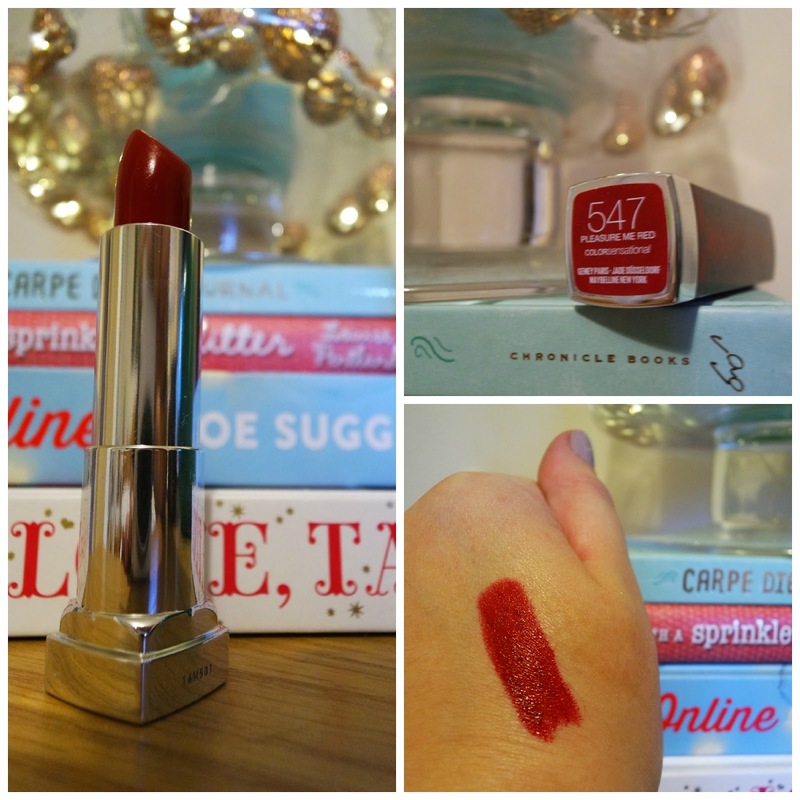 It's by Maybelline and it's in the shade 547 - Pleasure Me Red (ooh lala) It is a very deep red and at first I didn't feel comfortable wearing this (my friend Eilidh would tell you all that I put this on while we were at Costa and I had wiped it off after only having it on for about 5 minutes) but I have been wearing it around my house and I think, I actually think I can wear it out and about! This is my favourite time of year so I'm so looking forward to wearing this along with many more bright and bold colours! YAY! So they are all my August Favourites, it was very hard as I have had a lot to choose from. But I hope you enjoyed this post. I do have to say my overall Favourite is this Blog! I have loved doing it which I am surprised at because I have tried over the years to do a one and it's just never stuck, but I actually look forward to doing all my posts. I don't know where this blog is going to go or where it's going to take me but I'm sure as hell enjoying the journey! 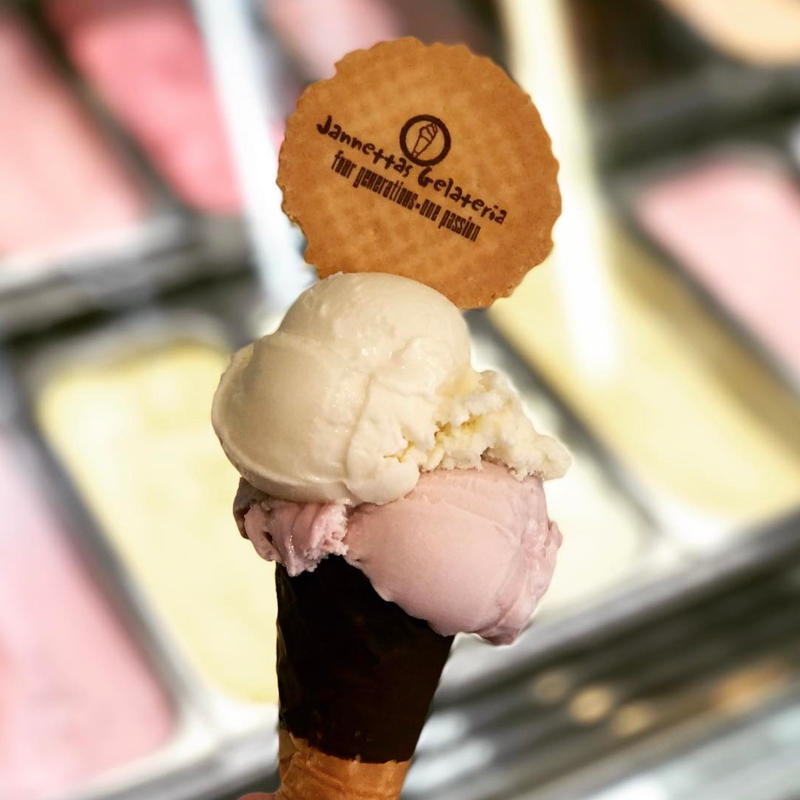 What have been your monthly favourites? Also please if you do read this and have a blog yourself leave your blog in the comments as I'd love to read it! 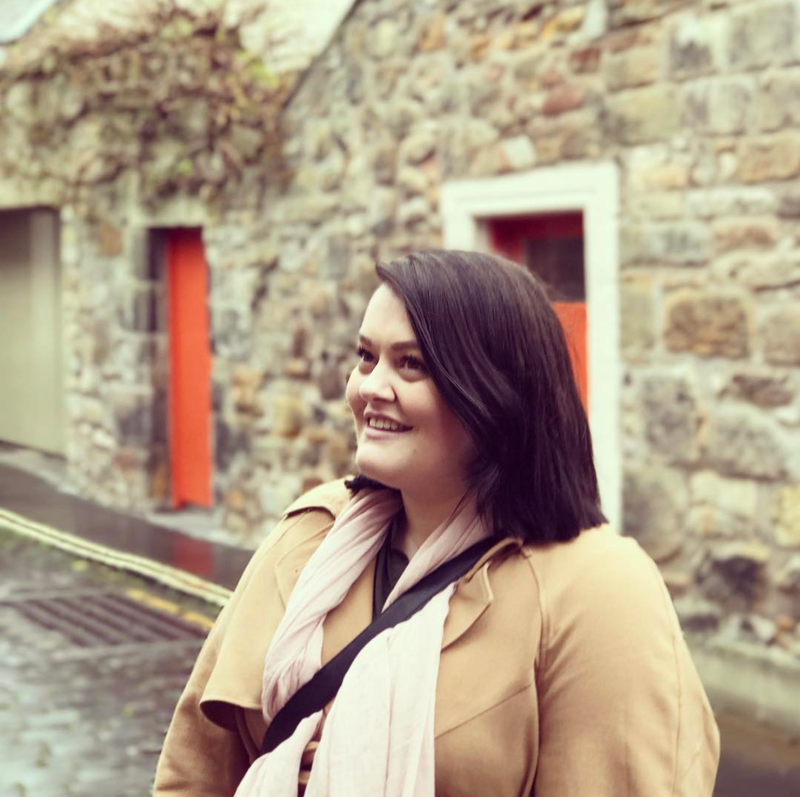 Guest Post - Eilidh Bee!